August Wilson wrote ten plays about the African-American experience, each covering one decade in the 20th century. He lived in St. Paul for over ten years and worked closely with Penumbra Theatre, which has produced more of his plays than any other theater in the world, including several world premieres. 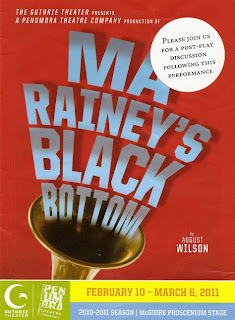 They're currently doing Ma Rainey's Black Bottom at the Guthrie, directed by Penumbra Artistic Director Lou Bellamy. 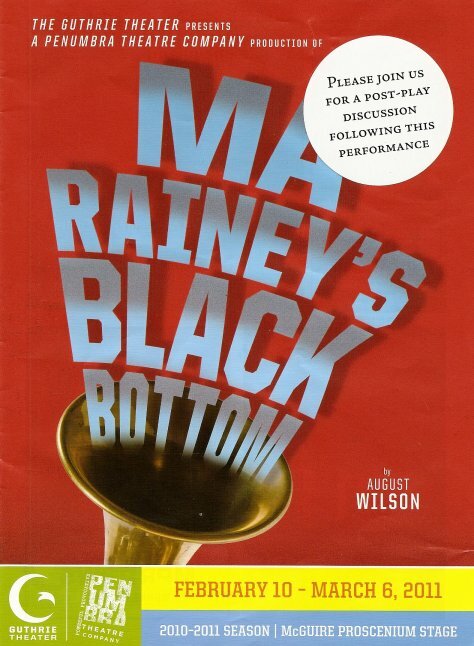 Set in Chicago in the 1920s, Ma Rainey is a fictional account of a recording session of the real life blues singer of the same name. But it's really about so much more than that. The way Wilson weaves in themes of racism and history and unspeakable horror along with an entertaining and humorous story is just remarkable. After the show there was a discussion let by Penumbra Education Director Sarah Bellamy and two experts on race relations, Herbert A. Perkins and Elona Street-Stewart. The discussion was much more profound and insightful than anything I could say! Everyone in this cast is amazing in their roles. Ma Rainey is played by Jevetta Steele of the fabulous local singing family The Steeles. Ma is what some might call a "diva." But really, she's a woman who knows what she wants and knows that her power is limited. Before her voice is recorded, while there's something that she has that the studio owner and her manager still want, she is able to exert some power over her situation. But as soon as the recording is done and she's signed the release, they don't need her anymore and she's nothing to them. The four-member band is comprised of Cutler (James Craven), the leader who speaks in rapid-fire words that reminded me of Tommy Lee Jones; Toledo (Abdul Salaam El Razzac), the wise and book-reading piano player; Slow Drag (William John Hall, Jr.), the easy-going bass player; and Levee (James T. Alfred) a young man who has dreams and ambitions of his own. He wants to play his own arrangements and improvisations, which does not go over well with Ma. Much of the play is these four men talking and joking with each other. Their characters are so specific and interesting that it's a pleasure to listen to them go on about nothing, but also difficult at times when we catch glimpses of the pain that's behind it all. The recording session hits a few rough patches. Ma wants her stuttering nephew Sylvester (Ahanti Young) to record an intro to one of the songs, and it's just heart-breaking to listen to him struggle with the words until he gets it right. Ma's glamorous girl Dussie Mae (Lerea Carter) flirts with Levee, spurring Ma on to jealousy. All the while the studio owner Sturdyvant (played by Michael Tezla, my costar from A Serious Man), watches from the office above while Ma's manager Irvin (Phil Kilbourne) acts as a go-between, making sure everyone is happy and gets what they want. Eventually the songs are recorded satisfactorally and Ma and her entourage leave the studio. The band is left behind to pack up their things. Levee gives Sturdyvant some songs that he wrote, hoping to record them with his own band. Instead, Sturdyvant gives him five dollars for each song and sends him on his way. Levee is devastated, and takes his anger and disappointment out on one of the other band members in a tragic ending to the play. It's an ending that's been bubbling up throughout the course of the play, almost as if it were inevitable. Which doesn't make it any less shocking. There's so much that needs to be said about this play, and I don't even know where to begin. I guess I'll close by saying: if you have the chance to see an August Wilson play, take it. Obviously I don't know a whole lot about what it means to be a person of color in this country. But I feel like after watching an August Wilson play, I understand a little bit more of our shared history. I'm making it a goal to see all ten plays in the cycle at some point in my lifetime. One down, nine to go. Just seen this show. It was awesome!Great cast superb story. The Actor to watch is the guy with the stutter he is genius in that roll and seen him around town in other productions, "Zooman and the sign".This actors range is incredible. Give that guy a Tony!